You know you don’t always have to go to exotic or faraway places to get a decent photo. I was lost for photo ideas today as hadn’t thought about it. Was very gloomy today and we were just about to sit down for dinner, when I thought let me go get a shot of tress in back garden. It was grey and nothing happening. So I pushed the white balance really low, so it gives that cool, blue shady light feel. It seems to work well for twilight. 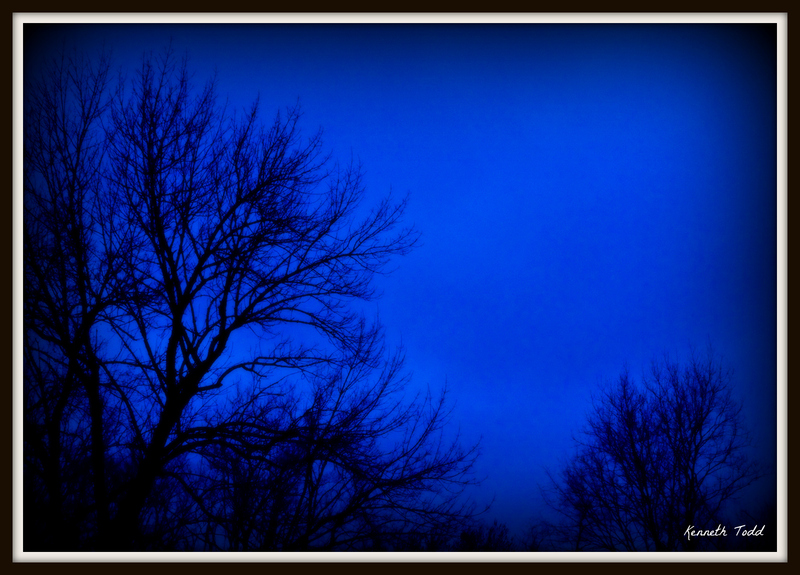 I then added an Orton touch (to make branches a little softer) a slight vignette, frame and signature. I like this one actually. Also remember last day….. I am giving away a FREE iPod shuffle to a random blog reader on March 31 (this is the last day of entering). Why? I have no idea. I am just doing it. It came to me after a recent meditation…:-). I get so many visits, likes and comments from people, which is pretty humbling for me, so I just want to give something back I guess. The best way for me to “control” it, is as follows. Just go “like” my Facebook page (link below), I will then get a random number generator off the internet and then pick the name that corresponds to that number. So good luck. Great shot with a very nice mood. I love this effect. Very dreamy. I like this photo too! Simple but beautiful. Great job! Beautiful colour! It is absolutely serene. Wonderful shot, Kenneth. Hi Roxi. Thanks for that. Never know what to do with these as have been nominated for these a few times now, so don’t know how to keep doing it? :-). Perhaps this is someone else who you could nominate? Thanks so much for nominating me, really really appreciate it. Pretty humbling. In Britain the trees have still to fully awaken to the spring and coming summer. Same here. Nature is confused by the weather. We have had days as warm as summer then cold, then warm, now colder. The tree branches are so soft, you can almost touch them… Thank you!